Thanks to athleisure, leggings have now become a regular staple in our wardrobes. Of course, given the level of comfort achieved while still looking put together, we’re not complaining in the slightest. That said, there are a few key factors to keep in mind when shopping for the latest addition to your collection: support, comfort, and of course, style. But as much as we would love to spend our days testing the most flattering leggings each day, our schedules (and bank accounts) don’t always allow for that to happen. Fortunately, with the help of the internet and customer reviews, finding a pair that are essentially guaranteed to look good on you is easy. Not only have these women tried these leggings out for themselves, but they’re also giving honest opinions of each one and how they work with their bodies. Ready to see the pairs shoppers can’t stop raving about? Below, you’ll find 16 customer-approved leggings you can wear on a regular basis. "The best!! I was on the fence with the moto look, not sure I’d be able to pull it off. I get so many compliments on these leggings! So comfortable, stylish, and fit great!" "I have a few pair of the Vince Camuto Leggings. Very slimming and very comfortable, without looking like scuba pants. They hide all of the bumps and lumps but make your legs look fantastic." "Love how they are higher waisted, are nice and long, and stretch. Supper [sic] cute and comfy." "They are great! Super comfortable for weekend running around, don't sag or stretch out, love them!" "So glad I made the decision to try these because they are AWESOME!! Champion is really on to something, and these are very comparable to more high-end leggings. They stay put, love the side pockets, and look very flattering on the legs." "These not only control your stomach; they control everywhere! They literally hold everything in without being uncomfortable." "These are my new favorite… They make my legs look amazing and are comfortable." "[These] fit like leggings but the seam down the front and the side zip really elevate the look so you can totally dress them up… The high-waist fit and the waist band really flatter your figure, and the seam down the front of each leg gives an elongating illusion, so I felt so cute and confident in these!" "These tights are so comfy, and look completely awesome… I'd by another pair; they look so good." "These leggings fit me perfectly allowing for a tad more room for any additional growth that may occur. The material is also great. Does not feel cheap. Will purchase more in the future for any available/needed colors for my wardrobe." "Love everything about these leggings!!! I love that they are super high waisted and the fabric [is] so soft and luxurious. They are form fitting and form to your body shape." "Finally a pair of leggings I feel comfortable in! Thick fabric that doesn't show all my lumps, smoothes me out. Love these!" "I literally will not buy yoga pants or leggings unless Zella makes them. I'm a size 18, so finding a comfortable pair of yoga pants that you cant see through and actually look good isn't an easy task. These leggings and any other plus-size legging that Zella makes is fabulous and worth every penny!!" "The most impressive part is the workmanship. Even at the high end, seams are always off and twist while wearing them… These seams are perfect (on both legs) and really well made. Yep, these are my most favorite leggings, no contest." "The best black leggings that I have. I bought a pair for my daughter as well, and we both love them. Great quality, good comfortable fit, and well priced." "Not only do these leggings fit like a glove, but they look great! The color changes hit at all the right places. I'm constantly getting compliments on them." 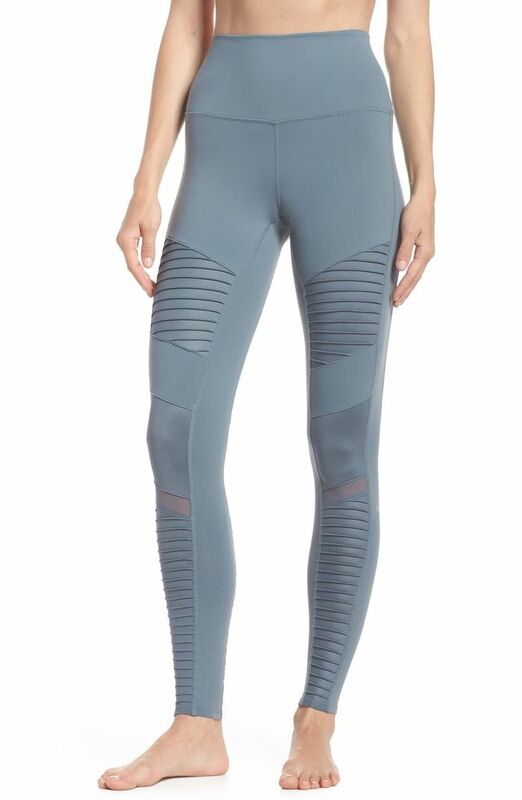 As if your workout game could get any chicer, this eye-catching leggings trend is too good to pass up. Reviews have been edited for clarity.